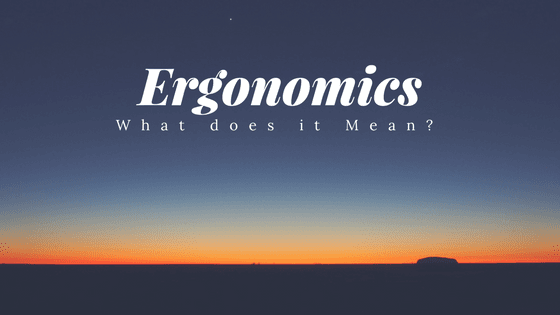 Ergonomics – What Does it Mean? The word ergonomic is the study of the interaction between individuals, machines or appliances in their environment that can affect their performance and productivity. The purpose of ergonomics is to assess the interaction, or relationship between each component for determining optimum performance. Ergonomic, therefore, examines the relationship between three elements: the individual, the equipment, the environment and how they can be improved. Ergonomic is usually the focus of ‘work’ as in employment performance, large in relation to the operation of machines/equipment in the employment environment. However, in view of the current economic climate, there is a growing shift in the employment environment towards self-employment activities. These activities are largely located within the home, where there is less regulation over manual handling and movement education. The new area of home office performance needs closer monitoring through ergonomic awareness and education. This is because many self-employed individuals do not see the dangers inherent in the repetitive operation of most home office equipment and systems. The most significant equipment to consider is the office chair. A combination of poor postural balance through improper pelvic control, usually caused by lack of physical exercise, creates a cyclical pattern of chronic musculoskeletal injuries. Assessing the environmental safety of the individual for the tasks required to be completed. This will include evaluating the seating and posture of the individual if prolonged sitting is going to be encountered during completion of the tasks. Evaluating the overall user-interface of the environment for making the relationship between the individual and the task more compatible. Modifying individual tasks for creating more efficient methods that suit the user’s characteristics. Changing the way performance activities are organized for accommodating individual physical, psychological and social needs in the environment. Each individual can then be assisted to increase performance by evaluating comfort levels of the operating station for reducing fatigue, preventing repetitive injuries and creating a harmonious working environment. The human part of any environmental system should be integrated into the design stage for effective operating of the whole system. If this is considered at a later stage, then the performance flow may be restrained through lack of ergonomic evaluation of the whole system in place. What Can an Ergonomic Evaluation provide for your business? Highlight areas of risk in the human environmental system, along with recommendations for improvement in productivity. Assessment in comfort levels of key operators for developing a more energy efficient flow to the operating system. An evaluation of the input and output information flow by individuals for more energy efficient strategies. How can an Ergonomic Evaluation improve your business? It can increase the comfort level of key operators for improving performance and reduce absenteeism from repetitive strain defects that impair productivity. Improvement in workstation layout can reduce job demands, risk factors, repetition and awkward static postures, as they relate to musculoskeletal injuries. Changes in the geographical positions of individuals and equipment may lead to improved harmony, plus greater energy efficiency to the working environment. Authored in part by Gail McGonigal.